The island-state of Singapore prides itself on its multi-ethnic makeup, which is most apparent during celebrations like Chinese New Year. Even as the holiday celebrates the island's Chinese majority, the nation's other ethnicities get part of the spotlight, particularly during the raucous Chingay Parade. When it first hit the streets in 1973, Chingay was a neighborhood street parade that was almost completely Chinese in character. Things have changed significantly since then – today's Chingay has long outgrown its original march route, having moved from the streets of Singapore's housing estates to the wide avenue in front of the Formula One Pit Building. And unlike the mainly Chinese festive elements of yesteryear's parades, the present-day Chingay presents the whole range of Singapore's cultures and more. Chingay is generally celebrated on the first weekend of the 15-day Chinese New Year festivities; for 2019, the parade takes place over two days, on February 15 and 16, beginning at 8pm on both evenings. The Chingay Parade now takes up a short parade route 360 meters long, with paying audiences lined up from viewing platforms alongside at the Formula One Pit Building, next to the Singapore Flyer. As the parade marches down the preset route, guests get an eyeful of acrobats, cultural performers, floats, and dragon dancers making a spectacle on the road, helped along with pyrotechnics and lighting. Every individual Chingay celebration has its own theme, usually based on the Chinese zodiac animal of that particular Chinese New Year. The parade is designed to conform with the theme; the Year of the Dog in 1994 saw the active participation of dogs from the Singapore Kennel Club; the year of the Water Dragon in 2012 had the dragon-festooned parade move on a watery track. Chingay Parade participants are selected from different communities across Singapore. You won't just see professional performers, but you'll also find representatives from political constituencies, HDB blocks, community organizations, and civic groups joining the Chingay parade to get their freak on in the streets. The main ethnicities of Singapore get their time in the spotlight - Chinese, Malay, and Tamil Indian marchers perform dances or stunts native to their culture, accompanied by floats that evoke their cultural history or mythology. Performers from all over the world get into the act for Chingay, too - artists from Malaysia, China, the Philippines, France, and Brazil have added their particular cultural twist to the mix. 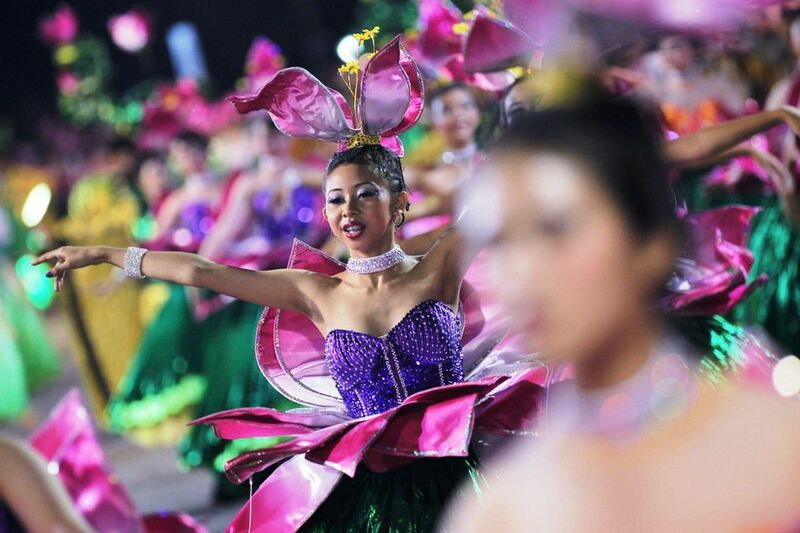 Singapore loves to welcome national performance companies from elsewhere for Chingay, as they did when the Ballet Nacional de Angola made an appearance, debuting Angolan music and dance in Singapore to the delight of Chingay parade viewers. At the end of Chingay, a street party continues the festivities until the wee hours. Chingay has roots in Chinese religious festivals, particularly the Taoist festival of Shang Yuan Chieh (held on the 15th day of Chinese New Year), and related parades held to honor Chinese deities. The word "Chingay" comes to us from the original Chinese zhuangyi - "the art of masquerade". Chinese immigrant communities in Penang and Singapore brought over the tradition of religious processions from their native land, and the parades quickly grew in importance and flamboyance. Things got out of hand; parades disrupted the flow of traffic and trade, and at the dawn of the 20th century, Chingay was abolished in Singapore. The tradition made a comeback in 1972, when the government banned the use of firecrackers. Eager to maintain enthusiasm for Chinese New Year, authorities revived Chingay – the renewed parade took place around Singapore's HDB housing estates, and was very Chinese in its content. Over the years, as Chingay grew in prominence, the parade was relocated to more prominent routes and lost its exclusively Chinese feel. The parade has marched in front of City Hall and in Chinatown, but it wasn't until the parade located to the Pit Building where a good balance was struck between the spectacle of the parade itself and the number of spectators viewing it. Over 6,000 performers participated in 2018's Chingay, with participants representing the Tamil, Malay and Eurasian Singaporean communities, not to mention a variety of foreign acts imported specifically for the occasion! To get to the Chingay parade, you can go to Marina Bay by riding the MRT and disembarking at the Promenade MRT Station (CC4/DT15), then take Exit A to make the five-minute walk to the Pit Building. For more on Singapore's convenient commuter system, read our article on Riding Singapore's MRT and Buses with the EZ-Link Card. Chingay tickets can be purchased from SISTIC (sistic.com.sg), and cost between SGD 28 to SGD 60. For more information, visit the Chingay website: chingay.org.sg. You don't have to pay to watch the parade, but free views tend to not be as good as the sight from the paid platforms. More information on watching the festivities gratis: The 3 Best Places To Watch Singapores Chingay Parade For Free (offsite).